What was it like to live in the Jazz Age, in particular 1913-1920? Fitzgerald wrote a story about a young couple that answers that question. 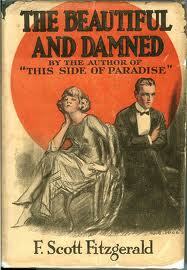 F. Scott Fitzgerald's The Beautiful and Damned was published in 1922, soon after This Side of Paradise. Capitalizing on the momentum of his novel about college life, he followed with a book on the social mores and lives of the same social strata. Anthony Patch, grandson of a wealthy and aging tycoon, lives a life of leisure and parties during the Jazz Age. At the beginning of the story, Anthony is 25 years old. He lives on a grand scale with his allowance, while he courts and marries Gloria, his desired Beauty. He promises her a life of ease, when he receives his inheritance. Anthony, Gloria, and their friends are the elite young adults of New York Café Society. In Europe, war is brewing. Anthony and Gloria seem unable to function without a supporting cast of friends around them every weekend. Left alone, they have very little to say to each other. Each has their moments of infidelity. Yet, they keep returning to the other. Alcohol is a constant factor. The first part of the novel takes place prior to Prohibition. War interferes, but Anthony is never deployed. Thirty looms on the horizon, but Anthony is still waiting for his inheritance. What happens next and how he copes forms the rest of the novel. Recommended. The first edition covers of The Beautiful and Damned are illustrated with characters drawn to resemble F. Scott Fitzgerald and Zelda. The Beautiful and Damned was serialized in Metropolitan Magazine in 1921 prior to it being published by Scribner's in 1922. This is the second novel by Fitzgerald. 'Bilphism', a term which was concerned with the 'reincarnation of the human soul' was created by Fitzgerald and used in this novel. It was expressed as a belief and was called 'the science of all religions'. Other novels by F. Scott Fitzgerald: The Great Gatsby, This Side of Paradise, The Last Tycoon (second favorite), and Tender is the Night (my favorite). Please check the other Fitzgerald reviews if you would like to know more. Have you read The Beautiful and Damned by Fitzgerald? Any favorites by the author? Did you know this story was serialized prior to its being published? Please share in the comments, and thanks for stopping by! I find it interesting that Fitzgerald wrote so much tragedy. "Write what you know" certainly didn't hurt his career. I like the "idea" of Fitzgerald. However, the tragic components of his stories are sometimes a little overwhelming. I can only read him once a year. His life was tragic, but he let us know all that is beautiful on the outside may not be so once you're close to it. He has some of the best of life and the worst of life. More than a little, LG. The 'beautiful people' sometimes cause their own demise. Knowing about the author's own life can sometimes make reading their books a richer experience. We can marvel that they still managed to write. . . It's somewhat of a travesty, but I've never read any of the novels by Fitzgerald and only a few short stories. I've overlooked much of the literature of this era and it is such a interesting time of modern history. I should do something about this. Good to have reviews like yours to at least put me in touch with these works. I'd suggest 'The Last Tycoon', Lee, since it deals with the movie industry and you have some history in entertainment, too. I like it best after 'Tender is the Night'. I'm still doing catch-up literary reading too. Thanks for this and I wanted to let you know that your reviews of Fitzgerald's work have inspired me to re-read The Great Gatsby, which I still am not fond of, and read The Last Tycoon, which I really loved. I have read many of his books, but they sort of flow together after 50 years, so I will try to find the rest of them and read them either over again or for the first time. Thanks for this. I'm not fond of 'The Great Gatsby' either. It's hard to feel sympathy for someone who 'wants to be as good as the old money'. 'Tender is the Night' is my fave. I'm glad I inspired you to look at them again. Thank you for your kind words about Soldier. I'm glad you are my friend. The feeling is mutual, Inger. Animals become part of our family. I understand. I love the way Fitzgerald gives us a peak into early twentieth century. I haven't read most of Fitzgerald's books, but The Great Gatsby is one of my favorite books of all time. I think the writing is beautiful and I appreciate the insight it gives us about the pursuit of money and the American Dream. I tried to read Tender is the Night once, but couldn't get through it. Although, I was pretty young then. I'd probably feel different about it today and should give it another try. I need to read the Last Tycoon too. I had an idea for a book about the movie industry in that era. I'd be interested to what Fitzgerald wrote about. Thanks for suggestions! The Last Tycoon was fun to read. Start with that one. It was a time of change for the cinema, just as publishing is changing now. I've never read this book, but it sounds like it portrays the 1930s elite society quite well. It does, Sherry. At a time when women were seeking and getting more freedom. You know, I never actually read any of his books. And this one sounds good. When my focus returns, I'm going to the library to pick this one up. Thanks for the info! That's where I get some of the older classics that I read - from the library. The characters are in their twenties in this story. This is an interesting book about an uneasy time in the world (the years leading up to WWI). That's true that we all have our own tastes. I have been trying to read more classics and I do have a preferential taste for the early twentieth century. I will definitely be looking this up after reading your words. Thanks. Hi Suze, yes I have read 'This Side of Paradise' (see link to review in last few paragraphs of post). This novel chronologically follows it as the college crowd get married, get careers, etc. I read this one a long time ago and have almost forgotten all of it. Maybe I should pick it up again. It's a book that will take you back to the teens and twenties of the last century. It makes today's world seem overly complex. Fascinating... I love Fitzgerald's work and have read three of his novels... but not this one. I need to read it. Thanks fir sharing, D.G. I enjoy reading Fitzgerald, too. I like that he experimented with techniques. The public didn't always like it. 'Tender if the Night' is my favorite. This novel evoked sadness in me, for I saw Fitzgerald and Zelda all too much in the story. It does give us a glimpse into what life was like for the wealthy back in the jazz age. John D. MacDonald does that for the sixties in his Travis McGee novels. Great review. I did too, Roland, and had to be careful when writing the review, not to say Scott and Zelda. Even the publisher called this novel and 'This Side of Paradise' thinly-veiled stories based on Fitzgerald's own life. I now have to check out those Travis McGee novels. Well, Tina, I've never READ 'TGG' because I didn't like the movie that much. However, it's one of the most popular of Fitzgerald's novels, so I knew most had read it, and for some it was required reading. I just make every third book a literary choice and pick and choose those authors I like. I still read genre and some non-fiction too. Reading 'Parisians' by Graham Robb right now. I like reading a bit of modern mixed with a bit of classic. I've read GATSBY and BENJAMIN BUTTON, but I should check out his other works. Interesting about the cover -- I thought the same when I glanced at it. I've not read Benjamin Button - but I haven't read any of Fitzgerald's short stories, and the same for Hemingway. One day, I tend to gravitate toward novels. Hey DG, I've never read this, I haven't actually read much of Fitzgerald, although I love the classics, and I'm not sure why that is. My tastes tend to run more toward the Russian masters when it comes to classics...Chekov, Tolstoy, Gogol...but I should definitely read this one. I feel sadly inadequate when people discuss Fitzgerald! Thanks DG. I used to read more Russian - Ayn Rand and Alexander Solzhenitsyn. I also read a few of the French authors - Sartre, de Beauvoir, Camus, and a few others. I neglected the American classics, so now I'm catching up. In college I did manage to read Kerouac, Vonnegut, and Kesey, though. You should give my Fitzgerald faves a try: Tender is the Night (love story based on Scott and Zelda), or The Last Tycoon (about the movie-making industry). Nice to know your reading choices. After high school, I didn't read any Fitzgerald. Gatsby was required reading, so that's probably why. In college, I read Tender is the Night. That was one drama-filled book. Making something required reading can do that! 'Tender is the Night' shows us that you can have everything (on the surface) and still not be happy. In support of a paper I was writing, I read all of Fitzgerald's novels when I was in high school, but that's been years (and YEARS!) ago. I enjoyed them so much the first time around, I later bought an entire collection of his books and put them on our shelves. Shame on me. I think it's time to re-read my old friends and stop treating them like decor. Thanks for the nudge. Great idea, Susan, and how interesting that you chose him to read in high school. I'd like to re-read some Asimov,soon as I finish reviewing all the books lined up in the TBR. Thanks for this. My high school kids have Gatsby as required reading, so I'm sort of in a Fitzgerald frame of mind. I've marked Tender is the Night to read (b/c I saw it was your favorite) - and I have this feeling I'm going to start reading and realize I've already read it, ha, but obviously long enough ago that I've forgotten, so worth a re-read. I hope you do, Nicki. Remember that earlier editions have the backstory in the middle of the book,while the later editions were more chronological. I read the first edition, which I didn't mind. Check my review for more explanation (link at end of post).